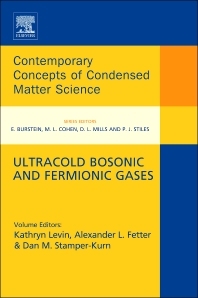 The rapidly developing topic of ultracold atoms has many actual and potential applications for condensed-matter science, and the contributions to this book emphasize these connections. Ultracold Bose and Fermi quantum gases are introduced at a level appropriate for first-year graduate students and non-specialists such as more mature general physicists. The reader will find answers to questions like: how are experiments conducted and how are the results interpreted? What are the advantages and limitations of ultracold atoms in studying many-body physics? How do experiments on ultracold atoms facilitate novel scientific opportunities relevant to the condensed-matted community? This volume seeks to be comprehensible rather than comprehensive; it aims at the level of a colloquium, accessible to outside readers, containing only minimal equations and limited references. In large part, it relies on many beautiful experiments from the past fifteen years and their very fruitful interplay with basic theoretical ideas. In this particular context, phenomena most relevant to condensed-matter science have been emphasized.